After a record mild winter, the grass is calf-high, and its time to bring out my collection of fine vintage mowers from the shed. I don’t know about you, but lawnmowers were a critical childhood gateway to satisfy my childhood lust for cars and internal combustion devices. My first mowing job came at the age of eight, when a neighbor inquired if anyone in our household was willing to make fifty cents. My mother had to start the Briggs and Stratton, and I was off on a long career of mowing, with a lightweight, easy-to-push mower almost exactly like this one. But I hate the evolution of mowers; they parallel that of cars: they’re full of safety devices and cheaper materials that have made them heavy and complicated. I gave up on a crappy (not a Honda) new mower years ago, and have assembled a mini fleet of the finest, lightest aluminum and magnesium deck best-mowing mowers ever. These are the equivalent of old Porsches or? And the price was right: I mostly found them sitting at the curb with “Free” signs on them. This old Montgomery Wards with the classic B&S 3hp engine may not be exactly a 1964 (I don’t read VIN numbers! ), but it’s representative of the vintage. A featherweight aluminum deck with nice “vacuum action”, the unobstructed pathway for the mowed material means this puppy will rip through the tallest, thickest grass, weeds, brush and baby rabbits without ever slowing down or clogging a deck or bag. Did someone say bag? The single most wretched invention in mowing since the safety handle and heavy steel decks! Leaving the clippings on the lawn is how grass naturally feeds itself! Why would anyone wan’t to go to all the effort to haul it off, and then have to spread fertilizer? This mower flays the grass so finely (and far), in a day or two, the cuttings aren’t visible. Or I long ago stopped caring. The most pathetic thing I see constantly is people struggling to mow thick spring lawns without the bagger and with the opening to the rear closed off; folks, it just doesn’t work! They end up mowing at a snail’s pace, and torturing the mower and themselves. I could whiz through their jungle in a fraction of the time with one of these babies. It’s another example of how what was common knowledge is now lost on so many. These mowers are absolute featherweights; I can pick one up ever so easily, and toss it in the back of my truck of xBox. In the sixties, when people had the priorities straight, light weight was a primary selling point for mowers. You simply have no idea how effortless these mowers scoot along, even up hills. And don’t even mention self-propelled mowers: think of mowing as good exercise, not a chore. I speed walk with this one. 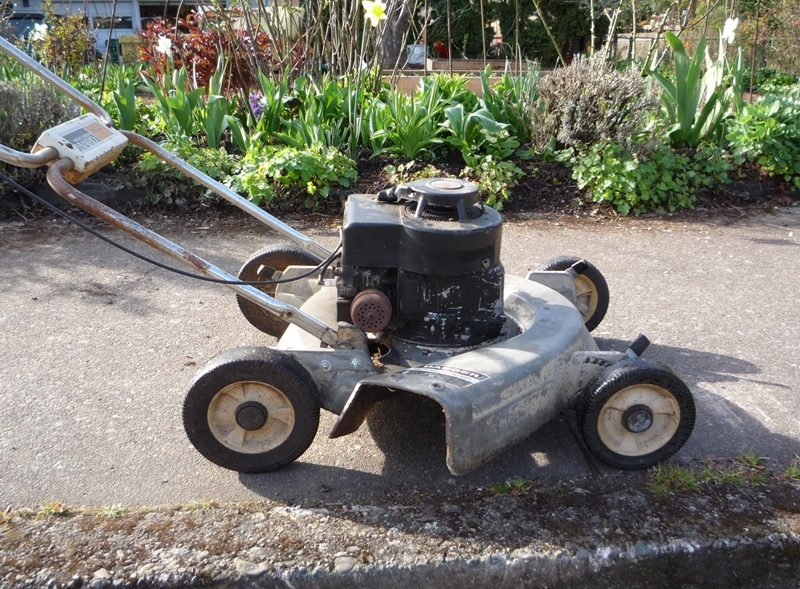 When I found this mower at the curbside, I was attracted by that lovely deck (I’ve become an aficionado of old alloy decks), but I pulled the starter to see if it would turn over. It was almost frozen up. The oil was totally empty. Good way to get a B&S to stop running. I brought it home for the deck anyway, put some fresh oil in it, and pulled a bit. It began to loosen up. Pull a bit more, put in some fresh gas, and it sprang right to life, the Lazarus of mowers. That was eight (now nine) years ago. And we (my younger son, mostly now) have about a dozen rental house to mow (they’re clustered like in a complex with common yard area). It hasn’t shown any sign of petering out yet, except for a mild drop in compression. I know where to find plenty more of these engines, if the need arises. But the deck is a keeper. The other mower in the fleet is a Sears (above), and it sports a genuine magnesium deck! It’s deck lacks the nice swirled chamber of the Monkey Ward, and the magnesium deck is having structural issues, such as holes appearing (from gravel?) and a big crack I had to mend with a steel plate. It probably won’t last as long as the other one, but it’s engine is still in the prime of its life, and has decades ahead of it. Well, instead of talking about them, it’s time to go put them to use. Which one shall it be today? 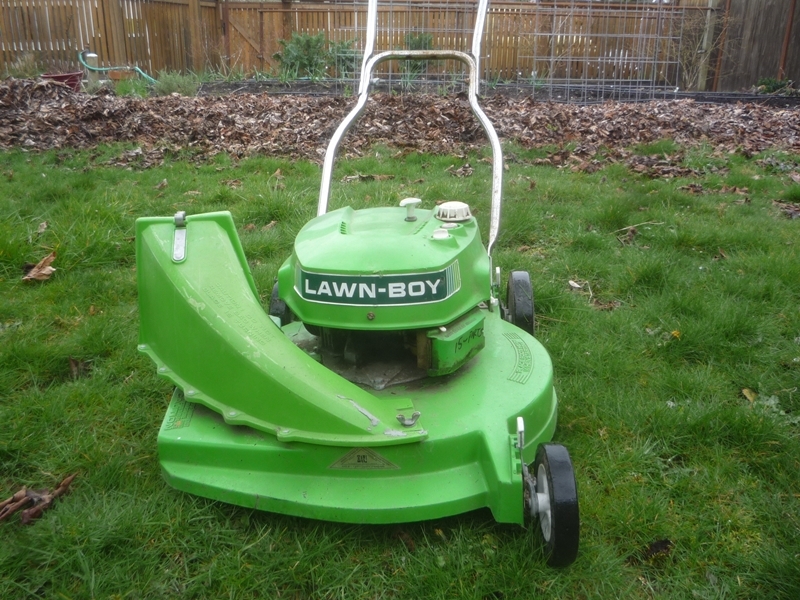 A Lawn Boy, considered by many to be the all-time durability champ. Two-stroke, which means a flavor of oil in the air. That makes me wonder if one could use vegetable oil, to make it smell like french fries? I picked it up last fall and have been too busy to mess with it, but I doubt it’ll take much to get it purring again. I discovered the miraculous simplicity and lightness of Lawn Boys when I had a gig mowing a neighbor’s lawn. She had one from the early fifties or late forties, similar but not quite the same as above. It was nothing but the deck, wheels, handle and a totally bare engine with exposed flywheel/fan which required a real rope starter, that had to be wound around the fan pulley each time. But it had to be the lightest mower ever built; the Holy Grail of mowers, if lightness and simplicity are your thing. They are mine. I’d LOVE to have one of these mowers. Lifting a modern 50-75 pound mower onto a three foot high tailgate all day can be a real pain, figuratively and literally. All I can find used are miserable MTDs and heavy Husqvarnas and Hondas. I too satisfied my mechanical cravings with lawn mowers in the 60’s. 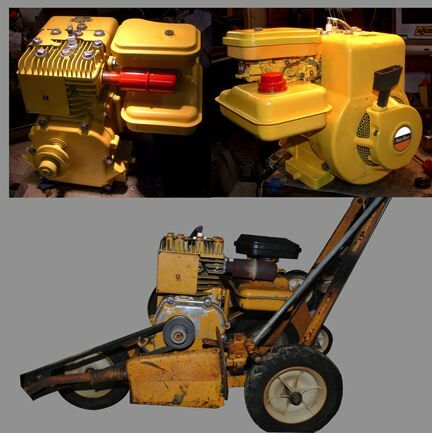 My uncle had one very similar to the first one shown above, and I mowed their lawn every time I visited them. My dad had an old mechanical reel mower which, while it did a nice job of mowing, didn’t satisfy my longings for a powered version. 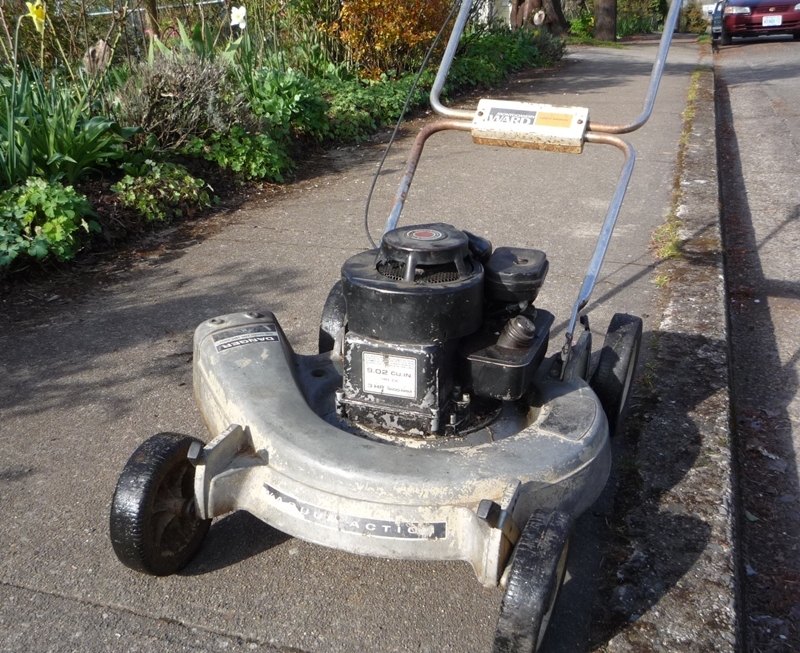 We did eventually get a rotary mover with a 2 1/2 HP B&S motor, following which my career in neighbourhood mowing began. 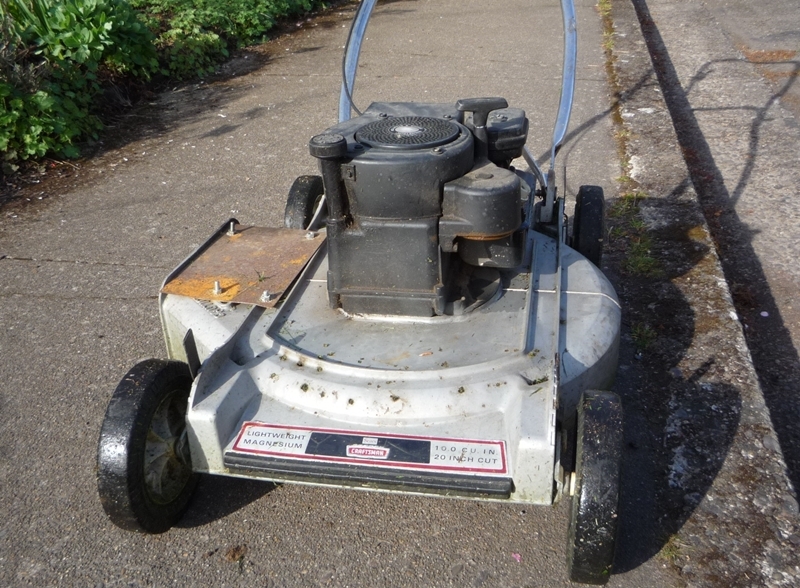 I think my favourite mower, though, was one I got later… a used late-70’s Toro. It was a rear-bagger, and if you didn’t attach the bag it was great at mulching the clippings so fine there was never anything visible. I would even mulch all the fall leaves with it, and there would be nothing left to rake! It was light, simple and ran for years. Probably still running somewhere, as I gave it away when I moved. We never purchaced a piece of yard equipment in my household growing up. Mowers, edgers, snowthrowers and on.. I never cared too much for the Lawn Boy at first, it took a bit of time to get used to the staggered wheels, it was nice though. We also had some strange 60s vintage mulching mower. The blade was a round disc with 4 blade “tips” attached to it. That thing was a dream to walk with, It had steel wheels with actual ball bearings in them..
Birddog, that mower would be a Jacobson, if anything. I have a nice collection of old timers too. twin 1959 Toro whirlwinds, (Mag. deck. 1 19″, 1 21″) and a 1948 REO 2 cycle. I used to have a General Motors Co. 19″ too. I love old mowers, good to see others who do too! 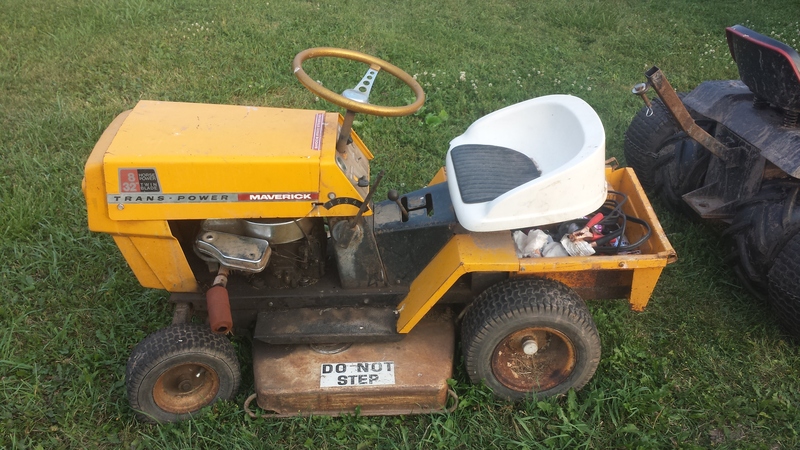 We have our rider mowers too… a 1964 WheelHorse, a ’75 WH, and misc. others! I have a circa 1980 Morrison 3in1 B&S 3hp same as your Sears the pull start broke but a socket welded to some round bar voila electric start just keeps going steel deck so easy to patch and parts at any rubbish dump. I always thought it was my nostalgic memory that made me think that old mowers used to work so much better than the new ones?!? Guess I was right all along. Alas, living in Florida, I no longer mow my own lawn. Lawn service is simply too cheap, it is WAY too hot in the summer, and grass here grows so fast and so thick it needs mowing twice a week. You have to bag the clippings here… our thick fake grass is just too fat to leave on top. My dad made me mow the lawn every week as a teen (for free!). I grew to hate the chore, and since becoming an adult I have only mowed grass a few times. It can take hours, and the lawn guy with his huge Dixie Chopper and crew knocks it out in like 20 mins, all for about $10 a week. I do love lawn mower stories. A few things though, if you have any size lawn at all (I have about 3/4 of an acre), the best mower for the job is the Toro Zero-Turning radius mower. After years of cheap lawn tractors, the Toro has cut my mowing time about half. It’s fun too, I can can zip around trees, bushes, poles, etc without having to back up. I actually look forward to mowing. The Toro also has a mulch kit, which disintegrates the grass into tiny bits. No raking or trails of grass. My Honda engined Lawn Boy push mower also has a much kit , but it seems to strain a little more with the tall grass. I grew up with a circa 1950’s Lawn Boy. My parents were depression era cheap, so we always had old machinery. I remember having to wrap the cord around the reel, It too, had the staggered wheels. Early Lawn Boys were dark green, not the the lime-green seen today. None of those fancy push bar controls either! The choke and throttle were all mounted on the carburetor. Naturally, at age 12, I couldn’t appreciate the fine points of the Lawn Boy, so my parents reluctantly bought a Lawn Chief mower, with controls on the push bar! FYI, it takes aproximatelly 4hrs to mow a 3 acre yard with dozens upon dozens of trees when you only have a 46in deck and a large turning radius. Once you try a zero turning radius, you’ll never go back to a traditional lawn tractor. They’re that much fun. The school district I work for has a king sized version of my Toro. Saves tons of money in labor. Back in the 80s, I bought my first house. Small yard. I started with an old fashioned push-type reel mower. I decided that there was a reason that people put motors on the wretched things. Then I went to a long-time mower shop and bought a reconditioned Lawn Boy. Older than your green one, it was tan from the mid 60s. That little mower started on the first pull every spring for years. It was old enough that it used a 16:1 gas/oil ratio. Lawnmower and mosquito fogger in one! I finally gave it away when my son was going to start cutting grass. As much as I grouse about modern safety features, I was in favor of them when it was my own kid who was going to use the thing. But it was a great old mower. I get what you’re saying about lightweight decks and organic lawnscaping, but I take exception with one other point. Although I usually leave my grass clippings where they fall, I need the bagging option whenever I encounter weeds in seed. I’ve almost eradicated dandelions in my large yard by hitting them as they blossom. The bagged clippings, seeds and all, go into the compost pile. Without this option I’d probably resort to nasty chemical methods instead. Very glad to see this new site, Paul. I’ve spent much less time enjoying that other car site since you departed. Those old push mowers run forever , I found an old aluminum deck Jacobsen trim mower in great shape last year for 40 bucks . It still even has the little chrome ‘J’ hubcaps on the wheels ! Your comments about the light weight of old mowers really hits home. As a kid, it was my job to use a push-mower on the yard…the one I preferred was an off-brand with a stamped aluminum deck. Amazingly light and easy to push. I’d managed to get a better cut by jiggering the governor so that little 2.5 B&S engine would really sing. Sadly, I destroyed it when I hit a high-planted cover for the water cut-off valve in front of the house…I hit the thing, HARD. Sheared off the protective bolts; the blade went flying free partly out of the housing. And the shaft was bent, and the engine frozen. As you described your experience in another section, I, too, learned all about Otto-cycle engines with that dead lawnmower…I had to make a lot of conjecture because even with the head off and the crankcase unbolted, that thing wouldn’t turn. Don’t remember why, now. The rod wasn’t broken; must have been binding in the valve linkage. When I was a kid, about 1967 or so, my next-door neighbor came out of the garage with a fancy new mower that sported a spring start. A handle flipped out of the top of the mower. He would wind up a spring on the top of the engine, release the flywheel with the throw of a lever, and the spring would start the engine. I swore to myself that one day I would have one just like it. Never happened, alas! We briefly had one of those. Not a better idea…there’s a reason they didn’t make them for long. Nasty; and when they got old, the detent that kept them from tuning would start to slip and…we had to junk it eventually. Also, it was a 25″ mower, which made it rather unwieldy. This post makes me fondly remember my parent’s Tor that they bought in 69 after buying their first house in 68. I started mowing with it as a teenager and I immediately appreciated the aluminum deck which was lighter than the steel monsters. I also really liked the actual hand throttle that allowed me to trim at low throttle for less noise and give a burst of power in tough spots. It was also stone reliable cutting for years with only an occasional trip to the shop for servicing. As an aside, when they bought the Toro from a mower shop (remember those?) the prevailing wisdom was that Lawn Boys were very expensive and had some reliability issues, as did the equally pricey Snapper mowers. Sadly I make do with a modern (2001ish) Sears mower with a steel deck and a 6hp B&S. While it’s a bit heavy and has the usual nanny state deadman lever it starts easily enough after a shot of carb cleaner at the beginning of the season and the failure was a cracked gas tank. 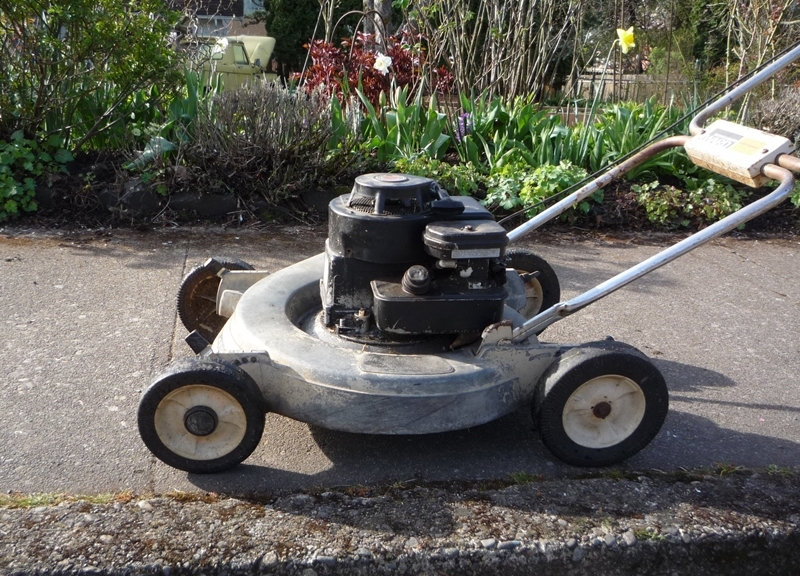 We had one like this when I first started cutting the lawn; my dad had bought it in 1968 when my parents bought the house, and it stayed with us into the mid-’80s. Helping him overhaul the motor periodically taught me the basics of internal-combustion engines. When that one died, he bought another for about $25 from a woman in the neighborhood whose husband had died, prompting her to hire a landscaping service. That one went another 6-7 years. No automatic blade brakes for us; we just followed the old-school wisdom of keeping one’s hands and feet away from a running mower. Ignore the double-post. Note to the creators of Bolt for the blackberry: I hate you. My great aunt had a Toro that my dad used to borrow when he needed to cut the grass before I was deemed old enough, ’cause we couldn’t afford our own and the old reel mower was getting too much trouble for him (I still have it and it works!). That Toro was a tank. 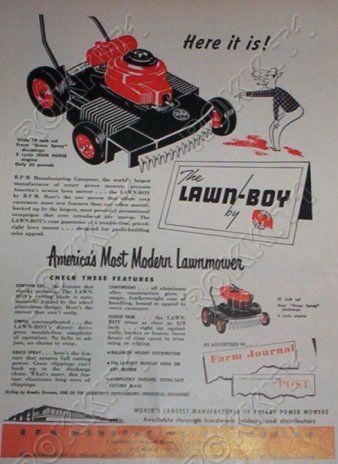 When that mower died, Dad finally scraped some money together and we went to Sears one fine evening and bought a massive, red, wind-up start 22″ model. That’s when I started cutting the grass, 1964, I believe. That mower worked very well for years, and if the oil was low, it wouldn’t start unless you topped it off. I believe my parents had that for about 8 years – not bad, considering how much I abused it and the utter lack of care while I was in the USAF! That ain’t nuttin. We had an old horizontal shaft engine reel mower that the reel driver had given up on. It would always start first pull every time. We had a vertical shaft mower that was a bear to start, but, would run great once running. We would start the reel, then using a fan belt looped on the rope drum of each would start the rotary. That worked great for carb adjusting also. No wearing yourself out pulling on a balky engine. I’m still trying to wrap my head around that! Let’s don’t just talk about Wards mowers! They made a 2 1/2 hp edger in 1973 and I still have mine. I am restoring it and just finished the engine rebuild. It is beautifully simple and has held up for many years. Let’s don’t just talk about Wards mowers! They made a 2 1/2 hp edger in 1973 and I still have mine. I am restoring it and just finished the engine rebuild. It is beautifully simple and has held up for many years. Here’s a photo. Original picture is on the bottom. Why do I love B&S horizontal shaft engines so much more than vertical shaft ones? Probably because the vertical shaft engines are almost always used on noisy lawnmowers. The horizontal shaft engines purr so nicely. I had a trimmer given to me once, and I had no use for it, but I just loved how that little 2.5 horse B&S purred. I know, putt putt putt putt. It runs better than my Harley… There’s a lot to be said for putt putt putt as opposed to potatopotatopotato! My father still uses his 1967 tecumseh powered sears magnesium push mower every week, it has the exact same deck and front badge as the one pictured above. no holes in his yet! Oh, man! Now mowers! It’s an old thread, but I gotta chime in. In another thread about overloading pick-ups (which I have oodles of experience in), I mentioned I’m a professional landscaper here in Florida, so I kinda know my way around a mower. I too, don’t like to bag, my time and motion studies don’t support it. I side discharge everything, and then do “clean-up” passes if needed. Mulching? You gotta be kidding me, try that with wet grass. When first starting out, I swore by the “el cheapo” 21-inch pushers. Light and cheap, but those Briggs motors are crapola (though not as bad as Tecumseh). Upgraded to Lawn-Boy for durability, those 2-strokes were worth every penny. My helper quit one day over having to push, and I subsequently discovered most self-propelled’s needed “help”. Then I got a Snapper. When they say “It’s a snap with a Snapper”, they aren’t lying. They will pull themselves out of a ditch! My first true “production” mower came in ’93, a used ’91 Toro 36″ mid-size walk-behind (Old Betsy). Talk about nirvana! You can put a stand-on “sulky” behind it, but I never did. Bought a brand new one just like it in ’02, and in ’06 a 44″ zero-turn-rider that cost more than the truck. The ZTR was nice, but it was heavy and too expensive; sold it and the newer 36″, and got a used 44″ mid-size. Back to “Old Betsy”, I always said when it died, it wouldn’t be scrapped, but rather i would bury it with a memorial. It’s been THAT good. The machine is now 21 years old, it’s had it’s share of repairs, but the motor’s never been open, not even a carburetor rebuild. If measured in homeowner’s use only, it would be at least 100 years old. I wish it had a hour meter, my estimate is 10,000 hours. It’s old and tired, but still stands ready for back-up duty. But alas, a tear comes to my eye. Last weekend, a gentleman asked if I’d like to sell Old Betsy, he saw it, and liked it. My initial reaction was no, it’s like family. Then I thought why not? I hardly use it, and it’s not what it used to be; so we haggled and it’s his now, for $525. I paid $1500 so many years ago, made at least a million bucks with it in tow, it’s time to say goodbye. Forgot to add, Old Betsy has a Kawasaki 12.5 hp; keep the filter clean, and it’s bulletproof! Lawns in Tucson: a rarity now. We had one when I was growing up in the 50s and 60s, and eventually my dad got a power mower (Sears). It was a big help back in those days. But lawns aren’t common in Tucson any more; the priority is to reduce water consumption, and lawns take an awful lot of water here. Mostly, if people have a lawn, it’s a very small one for the kids. Favored landscaping here is with plants that do well in a dry climate. People will make an exception, though, for citrus trees, although our winters will occasionally kill or severely injure citrus (really!). Nothing like the fragrance of citrus trees blooming in March and April here. There’s one lawn remaining in our neighborhood; I think it’s been grandfathered in. Maybe the original owners of the house still own the house; the neighborhood was built in the late 60s and early 70s. We’ve been told the neighborhood originally had putting greens throughout; they’re all gone, and all of the landscaping is desert-compatible plants. So, no lawn mowers around here, except for the one house. We hear a lot of blowers, though. I used an early 80s Toro side discharge with front wheel drive when I was a kid mowing lawns…really shallow deck but it cut well. I remember my neighbor cussing his Lawn Boy because it never wanted to start, and with teh staggered wheel it would leave “smiley faces” in the lawn if you weren’t careful. I use a 90s era Snapper Ninja with the old-school Snapper rear disc drive set up…great suction, built like a tank. I paid $50 for it several years ago. My wife prefers her Honda HRX217 but it has poor suction and leaves stray blades of grass standing up, which irritates me to no end. I would have a shed full of old mowers if my wife would let me, but, alas, she won’t. Your Monky Wards is a 1968 or 69. The engine is from the mid-1980’s though. That engine should be cream white, with a gold Briggs decal, red lettering saying “3.0 HP, 4 cycle, Milwaukee, Wisconsin.” and it was diamond shaped. (If you had the right one.) Your definitely right, these mowers were the best! 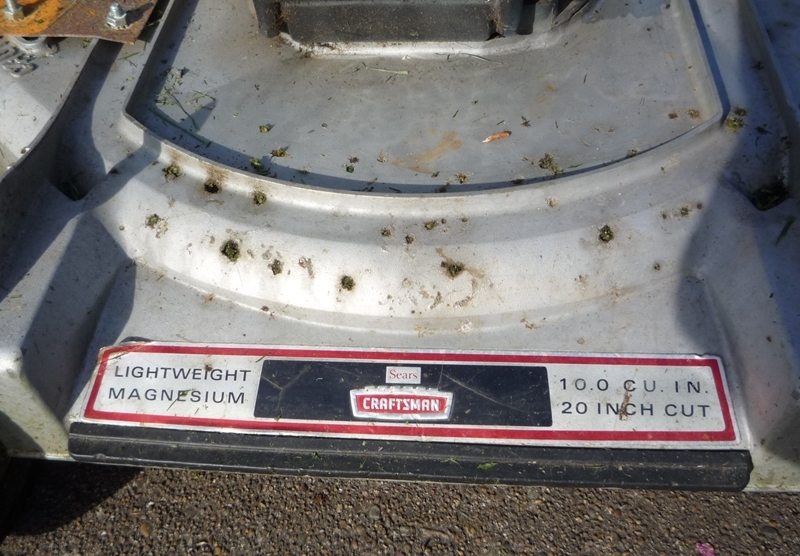 I sort of dislike Magnezium because of holes.. but I still mow 9 lawns commercially, and the newest mower is a 1986 LB. Great to see others like me… No old mowers where I am.. they’ve all died off. Too bad.. I have a old tractor that’s mad by “general part company” model “maverick”.the company went out of business in 1970 or that’s what I read. I can’t find anyone who knows anything about it. It has all the bells and whistles. Electric start, cig lighter, lights and, the pickup box. Any info would help. That looks just like an old Bonanza ‘Pickup’ tractor! I don’t know anything about them though. I think they were built by AMF. I remember as a kid around 12 to 13 I used to mow several lawns. Did pretty good on pay too. In a year I had enough to buy a 24″ front discharge staggered wheel mower. It had a Briggs 3 hp engine. Had a choke & throttle on the handles. I paid 70 bucks for this mower new. That mower did a fine job cutting grass. The grass was discharged almost as soon as it was cut. It never bogged down now matter how thick the grass was. I used that mower up until I was 18 years old. I went off into the military then. My dad hit a steel pipe & bent the crankshaft. End of the mower. Wish I still had it today. These new mowers aren’t worth the powder to blow them up. Too many safety features because of all the idiots that cant understand anything & have not a lick of common sense. These people today don’t even know what common sense is. The Lawn-Boy was a great product. They were indestructible if you remembered to mix the fuel and oil correctly (and if you didn’t, there was a good chance you could free up a stuck engine to live again.) Hillside mowing didn’t starve them for engine lubrication like the four-stroke cycle engines. Their only “weakness” was the exhaust port periodically clogging, which of course limited fuel intake (mixture in must equal exhaust out.) When you understood that, you were good to go. However, I warrant that many of these were scrapped due to a clogged exhaust port/muffler by uninformed owners.